Reprinted by permission of G.P. Putnam's Sons ©, Inc. It is with good reason that Mark Berent has consistently received this kind of praise. Berent, himself a highly decorated pilot, has seen his share of action, having served in the Air Force for more than twenty years and survived three tours of Vietnam. In his three previous novels, all a part of the continuing saga that Kirkus Reviews has called "one of the best Vietnam War fictional histories," Berent has demonstrated an unparalleled ability to recapture the Vietnam experience with vivid intensity. Berent's remarkable storytelling places the reader directly into the heat of the battle, dodging missiles in the sky and countering blows in hand-to-hand combat. As Tom Clancy says, "Berent is the real thing." In Eagle Station (June 8, 1992) the newest installment in his Vietnam War series, Berent puts on the heat and raises the stakes, creating his most electrifying tale of war to date. 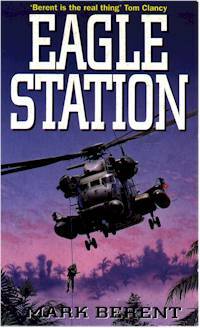 Beginning with a hair-raising cliffside helicopter rescue under heavy fire, and racing toward a climactic ground battle played out in the dark of night, engaging top secret USAF first special operations gun ships, Eagle Station is filled with adventure and acts of daring, woven into a compelling and powerful plot. Three Young Cadets, Kenichi Tanaka, Joe Kelly, and Manuel "Little Cat' Dominguez, all subjected to the cruel hazing of an arrogant and vengeful upperclassman, band together in a show of unity and strength. Years later, this solemn oath of brotherhood will hold them together, and be severely tested, during cataclysmic events in Vietnam. Located only 24 kilometers from the North Vietnamese border, in supposedly neutral Laos, Eagle Station is one of the most strategically located and important American radar installations, particularly for the fighter pilots and air rescue squadrons attempting to navigate the North Vietnam skies. When an explosion cuts off radio contact with the site, botching a life-or-death aerial rescue, it becomes clear that some unknown predatory group has set its sights on capturing Eagle Station. But who? Is it the communist Pathet Lao or the North Vietnamese? Or could it be the Soviets' elite Spetsnaz teams? Returning from Berent's earlier novels, USAF Major Court Bannister and Special Forces Colonel Wolf Lochert join forces, agreeing to prepare the station for the imminent attack, not realizing that ultimately the primary defense will rest solely in their hands. Days before the November 1968 presidential election, President Lyndon Baines Johnson, hoping to steer the vote in favor of Humphrey, prepares to make a major announcement concerning the war. General "Whitey" Whisenand, recognizing the possible devastating consequences of Johnson's move, tries to dissuade the President, but to no avail. When his efforts fail, Whisenand sets in motion his own daring plan. USAF Major Algernon A. "Flak" Apple, the first black pilot ever shot down over North Vietnam and captured, lies bruised and unconscious in a hospital bed. After his attempt to escape from the "Hanoi Hilton," Hoa Lo Prison, was thwarted, he had been mercilessly tortured, almost to death, before being sent to the Hanoi City Hospital. But his captors are not yet done with him. Using psychological trickery, they attempt to "condition" him, preparing him for a role in "Valiant Struggle," a top-secret plan that, if successful, could shift public opinion in favor or the communists. As these unforgettable characters are drawn closer together, as the clock ticks faster and the tension mounts, everything coalesces in a heartstopping climax. In the skies and on the ground, the siege on Eagle Station is about to begin. And through Mark Berent's descriptive powers, readers will take their places alongside Court Bannister and Wolf Lochert, on a death-defying mission into the heart of the Vietnam War.